Welcome to Campbell's nursery! We are officially done decorating this room. Now all we need is a little boy to come live in it! 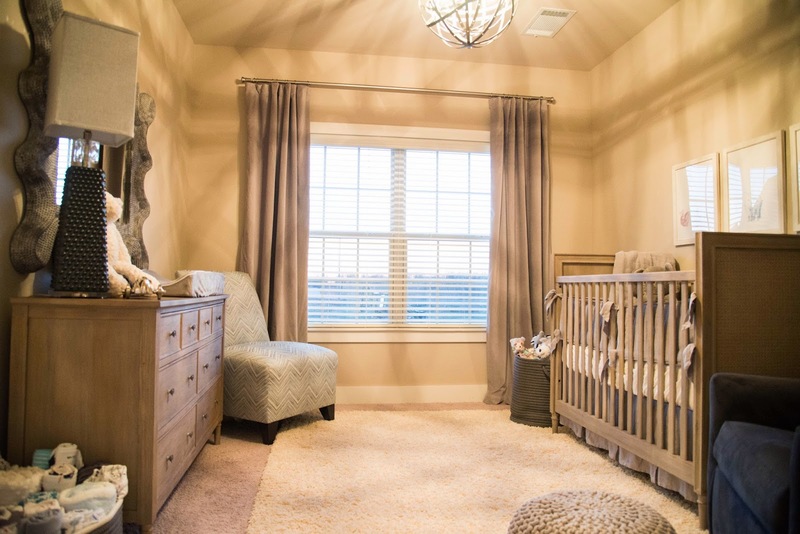 I've always known, regardless of gender, that I wanted to do a grey nursery. Most of our house is done with a grey color scheme and I felt like we should keep that flow going throughout the house. Right when I found out I was pregnant I started browsing the furniture at Restoration Hardware Baby and Child. 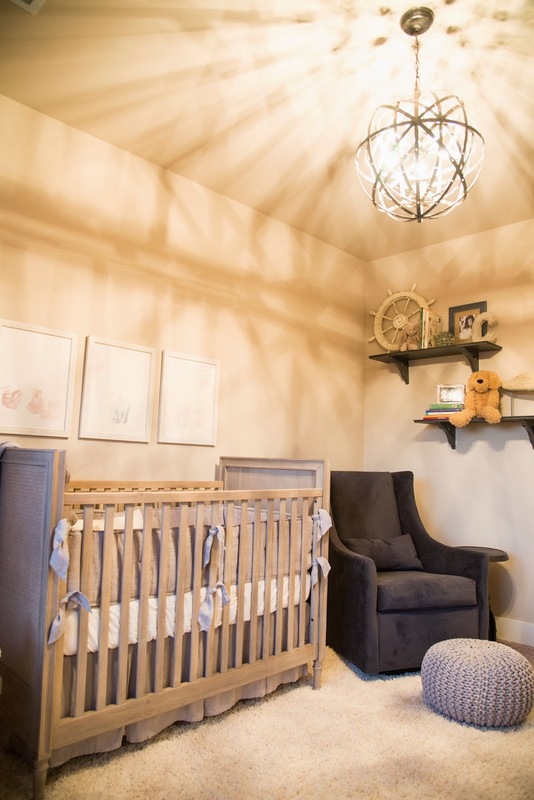 All of their baby furniture is exactly the look I wanted to go for so I knew we would be purchasing the main nursery pieces from there. 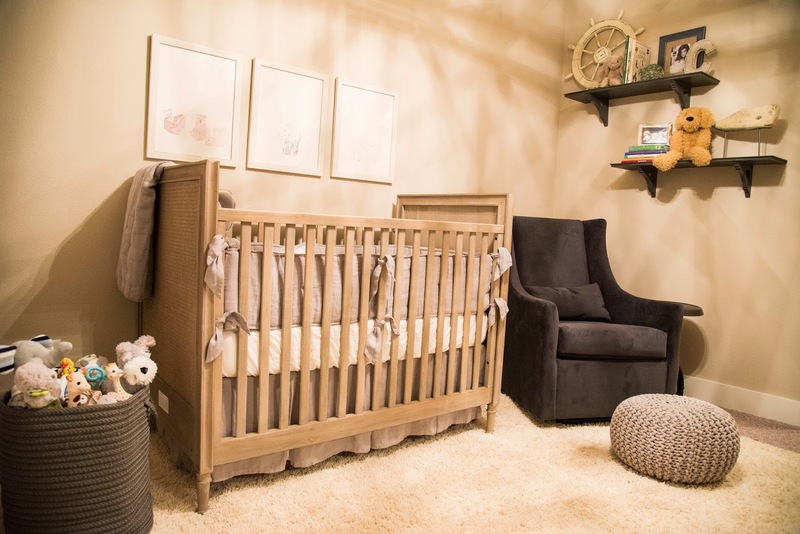 We ordered many wood swatches and loved a lot of different cribs but ultimately we ended up going with the Layne Crib Collection. One piece of advice that my BF gave me was to have two chairs in the nursery. This way Scott won't have to sit on the floor while I'm in the glider rocking or feeding Campbell. I thought that was such a great point! I found this chair from IO Metro and ended up picking out a custom fabric that would match the rest of the room. I LOVE the chair. Not only is it super comfortable but so cute as well! It's kind of hard to tell in the photo but it's a chevron pattern of different shades of grey, blue and white. Perfect for a little boy's room! I always thought I would go the custom route for baby bedding but ended up purchasing this simple bedding from Restoration Hardware. The grey linen is exactly what I wanted and was about half of the price of the custom route. I'm very pleased with the way it turned out! I found that the art for Campbell's room was the most challenging task in decorating a boy nursery. I didn't want it to be baby-ish or cheesy but I still wanted it to look like a little baby lived there. Enter these shelves! They quickly solved my problems. 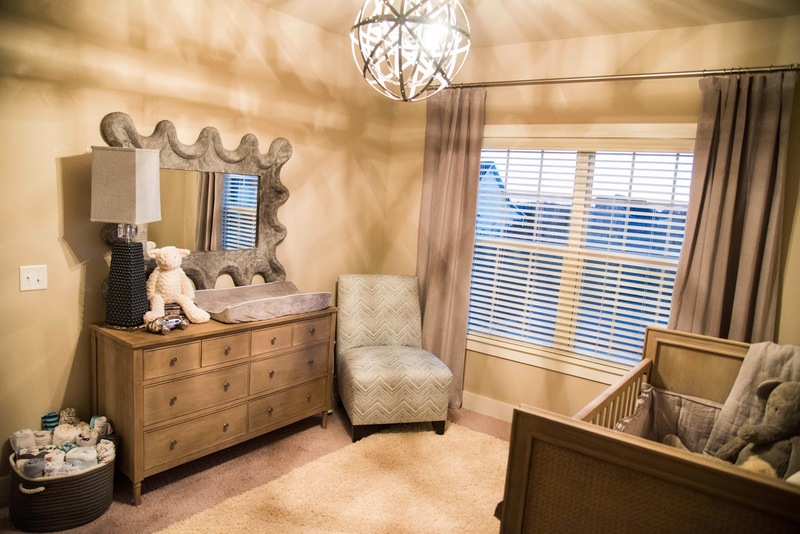 I liked the idea of adding some fun elements to the room such as books, pictures and stuffed animals. Plus when he gets older we can replace the baby-ish items with big boy items. The art above the crib are animal prints that I got from RH. They're the one really baby-ish element in the room and I surprised myself by getting them but I think they're really sweet. They're also light weight which was important to me. The thought of something heavy going over the crib--and possibly falling on my baby while he was sleeping--sent shivers down my spine. My glider is from West Elm. It was the first big item we purchased for the nursery. The fabric is a soft velvet and the chair is really comfortable. So there it is! My little one's room. I'm not going to lie, it was more challenging than I thought it would be but I knew it would come together and I love the way it did! I spend a lot of time sitting in the glider in piece and quiet just looking around. I think it's a calm and relaxing space, which is exactly what I wanted. 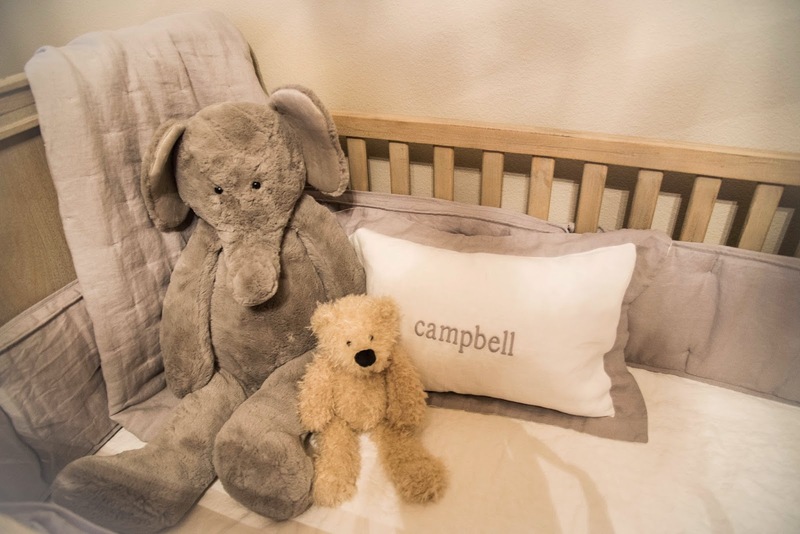 I hope my sweet little Campbell enjoys his room as much as I do!